Too often while writing reviews I find myself disassociated from the aroma or flavor notes that I’m trying to convert into words. I haven’t literally put my nose into a honeysuckle blossom in probably twenty years, and yet when that honey-sweet floral nectar-y note appears in something, I find myself typing the words. Some aroma memories are powerful like that, but others are more ethereal. I probably couldn’t really tell you the difference between toffee, caramel, and nougat, and I don’t really have an intensely strong sense-memory of those things. Mostly they smell like cooked sugar, I guess. And then along comes a sense memory that is so powerful it snaps you back in time. I grew up in semi-rural New Hampshire and one of the highlights of the year was the county fair. This event was complete with a horse pull competition (or “hawse pull”, in the local patois), rickety carnival rides, and awards for 4H presentations. I never participated in 4H, but our family was acquainted with at least one family that owned sheep, and I can recall being near the creatures on more than one occasion. Despite their fluffy white appearance, I can tell you one thing: sheep don’t smell great. My memory of the aroma, if I try to put it into words, is a combination of rancid lanolin, must, manure, and flatulence. The dip itself (used to inoculate the sheep against pests and fungal infections) smells like concentrated bugspray. 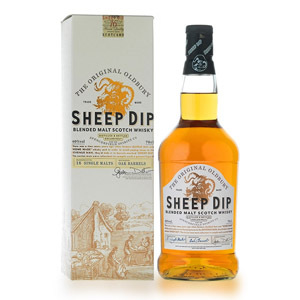 Sheep Dip – the whisky – by Spencerfield Spirits (now owned by Ian Macleod Distillers Limited) is a blend of 16 single malt whiskies purportedly between the ages of 8 and 20 (although there is no “8” on the bottle) all aged in first-fill ex-bourbon casks. Famed blender Richard “The Nose” Paterson is said to be behind or involved in the blending. 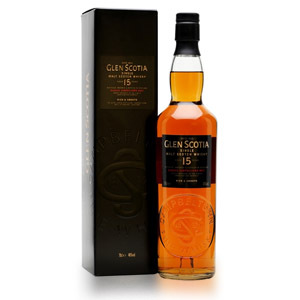 It’s bottled at 40% ABV and retails on the low end of the market for malts, around $35 – $40 US. The name is actually related to actual sheep dip, and refers to a moonshining practice in England whereby illicit distillers would disguise barrels of unreported whisky as barrels of sheep dip. 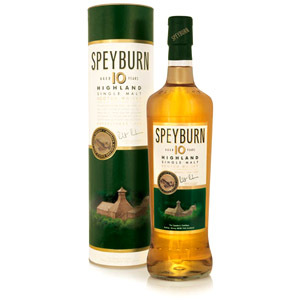 The company also sells a blended scotch named – appropriately enough – Pig’s Nose, and another blended malt called The Feathery. My first thought upon seeing the name was how common it seems to be to draw associations between whisky and animals, but I’m a fan of Monkey Shoulder which sounds even weirder so… why not? Nose: Astringent note of lemon furniture polish assaults the nose first, with a musty overtone. By God this actually smells like sheep dip (or more likely sheep as my memories of sheep-related smells are in the distant past). No, that’s not a good thing. Lanolin (another sheep-related smell) and dry fungal – almost sulfury – malt arrive next. A rest in the glass dissipates these, leaving some pretty standard ex-bourbon notes of light caramel, nougat, honey, and vanilla. Palate: Thin-bodied. Sweet malty notes of caramel and toffee join black licorice and root beer after a short tongue burn. Finish: Short. Licorice again, and a fading bitterness, including some oaky mouth-drying tannins. Fades without much else. With Water: A few drops of water make the licorice/anise note more piercing, now smelling more like cardamom. Other than that, no change except for a slightly sweeter root beer note on the finish. I don’t see a reason to bother with water for this dram. Overall: Boy howdy, those are some awful notes fresh out of the bottle. I highly recommend letting this one sit for a bit before getting it anywhere near your olfactory senses. Once you do though, you risk being thoroughly bored by this mediocre-at-best assortment of ex-bourbon malts. I can find nothing to recommend this particular blended malt, and the sheep association in the name does it no favors, monkeys, grouse, turkeys, dogs, and foxes notwithstanding. Thanks for the review. I’ve been thinking of picking up a bottle of this for some time now. I have agreed with almost totally with all your reviews. For a blend this price with your review I think I’ll just grab two bottles of teachers! I finally broke down and bought a bottle. Pretty bad when first opened, but it tamed to a fairly mediocre blend after a while. 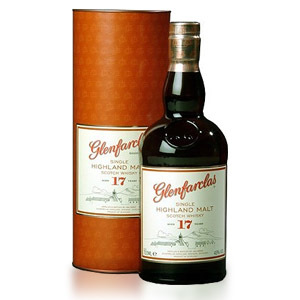 Drinkable then, but Shackleton is 25% less expensive and better, if you want another blended malt. Or just go for Oak Cross, which is the same price and ten times better.